Now, according to the Huffington Post and the Independent in England, he has done a kindness for someone living in an oil tank that got too famous after Banksy painted it. ” ‘I looked out of the hatch, and there were two guys there,’ he told the Independent. ‘ ” They were writing on his home. “Less than two weeks later, after buying the tank directly from the city of Los Angeles, the owners of the design firm Mint Currency had it removed by crane and trucked away, leaving Covington just 16 hours to gather his possessions and vacate his home of seven years. That’s when Banksy stepped in to help the man he’d inadvertently left homeless, giving him enough money to find an apartment and pay his bills for a full year. 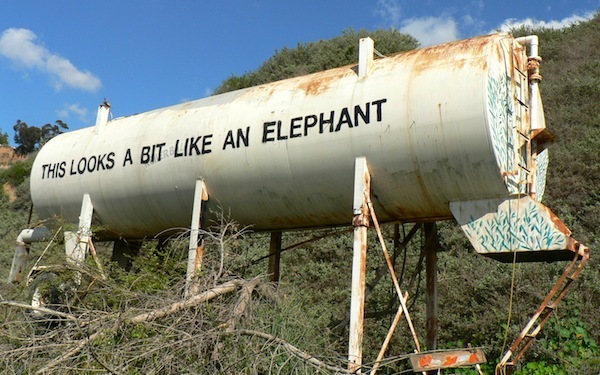 In 2011, while in Los Angeles promoting his documentary “Exit Through the Gift Shop,” the shadowy British street artist Banksy tagged a vaguely elephantine water tank near the Pacific Coast Highway with the sentence “This Looks a Bit Like an Elephant.” Unbeknown to him, the abandoned tank had been serving as a makeshift home for Tachowa Covington, and the attention brought by the famous artist’s stencil forced him to abandon his home of seven years. Where do you find this stuff? It’s fabulous, enlightening reading! I love Bansky’s work! Some of the most poignant social commentary, of our times, often tinged with a sense of ironic humor! Great story about a real talent! I love his work, too. One thing that is noteworthy is how accessible it is in a time when much art is obscure. I like obscure, too, but you get the sense that he wants every sort of person to have something interesting to think about and enjoy. It’s not simplistic, but it’s not so deep that an ordinary person would walk by with a shrug.